The Dallas Stars assigned goalie Cristopher Nilstorp to the Texas Stars this morning, indicating that Kari Lehtonen is ready to play Tuesday against the Pittsburgh Penguins. Nilstorp only saw work in a relief role, allowing three last night in a 7-2 rout by the Jets. The Texas Stars are expected to make a corresponding move to send Josh Robinson to the Idaho Steelheads. In case you missed it this weekend, here's a story I wrote about Nilstorp's sensational play for Texas since December. 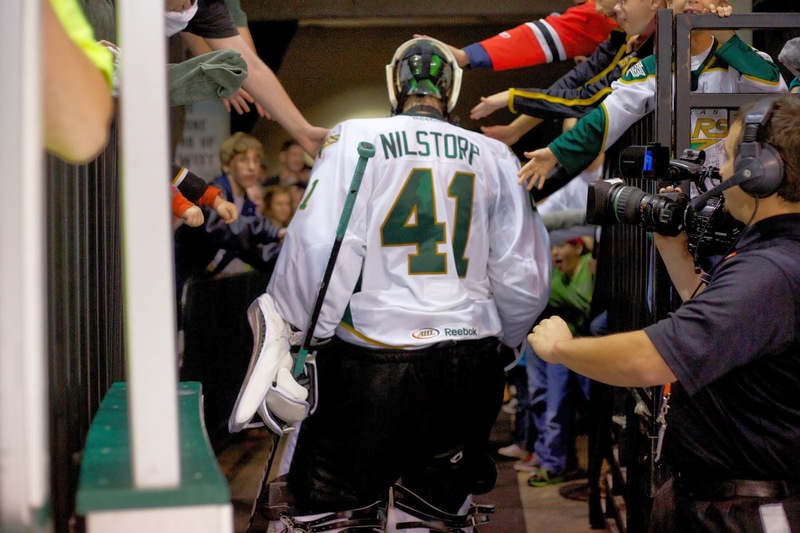 The Texas Stars, proud American Hockey League affiliate of the Dallas Stars, announced today that Dallas has returned goaltender Cristopher Nilstorp on loan to Texas. Nilstorp, 30, has appeared in one NHL contest this season, stopping 14-of-17 shots on March 16 against the Winnipeg Jets after being recalled from Texas on March 9. The 6-foot-3, 190-pound goaltender has posted a 21-12-4 record for Texas this season with a 2.58 goals-against average and a .915 save percentage. His 21 wins are currently tied for the fourth-most in the American Hockey League. The native of Malmo, Sweden was signed by Dallas as a free agent on June 5, 2012.